I managed to pick the key lock of the safe using these lock picks. Now it only takes me up to 20 seconds to pick that lock. It seems to be a standard cylinder lock with now extra security. The cylinder rotates a few degrees and then stops. When I now turn the combination dial I can feel the key cylinder changing its rotation angle and the dial rotation is hindered by some friction. A first analysis of the dial indicates a deep depression between 55 and 59. At the moment I assume this to be the cam gate location. Once the notch drops into this I have to turn the key cylinder slightly back to get out of it.This indicates that the cam gate has steep sides and maybe even the lever nose. If that is true I wont be able to measure the lever nose depth by measuring the cam gate width. Another approach would be to measure the key cylinder rotation angle which should be proportional to the nose depth in the cam gate. From an expert on the internet I learned that this type of safe typically has fixed flies and the cylinder key lock is essentially the handle. The fixed flies are much cheaper to manufacture. It essentially means that the safe has two different combinations depending on the initial dialling direction. This slightly complicates the standard approach since direction has to be taken into account. I might need to measure the fly width to get a better understanding of the lock. The key lock being essentially the handle means that to open the safe one would first dial the correct combination and then turn the key to retract the bolts. The next step is to set up some good way to measure the cylinder rotation and the graph the nose depth (angle) at the cam gate for different combinations. I managed to buy another locked safe in this TradeMe auction for 30$NZ. This one might work out to be quite a nice challenge. The safe has a key lock and a combination dial, but no handle. I don't have either the key or the combination. The label indicates it is from Dong Band Safe Manufacture Co., Seoul. Korea (fantastic name). It is quite small (48cm x 37cm x 38cm) and I can carry it around (less than 30kg). I don't think there is anything in it since nothing rattles or falls around when I turn it over. Turning the dial I can feel it picking up three wheels. The last wheel adds quite a bit of friction. 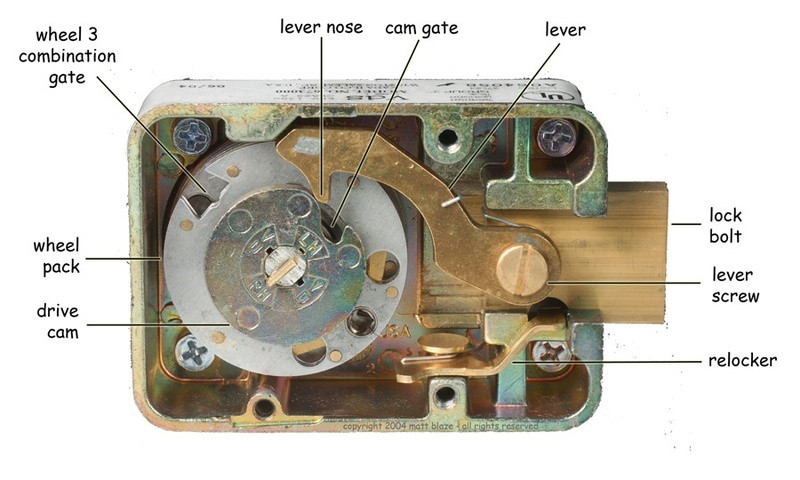 I can't feel any cam gate, which would indicate that the lever nose (see picture below) is held above the drive cam by the key locking mechanism. This means that the key lock has to be picked first in order to have a go at the combination lock. I will have a go at it this weekend and post if I make any progress. After some reading online I figured that picking the tubular lock shouldn't be to difficult. Unlike a cylinder type lock all the pins are nicely accessible. One just needs a good tension wrench. I found this link on dealextreme which offers a tool that should open the lock in seconds and enables one to make a working key afterwards. I did however pick the lock manually. The first time it took me about half an hour. I used some dentist tools that I had. The safe was empty but for a small screw. The next day I made (with some help) a nice tension wrench and I can pick that lock in 5 minutes now. The batteries for the keypad can be access from the inside. They had leaked and it took me some time to clean up the mess. However with new batteries the unit sprang back to life. There is a small red button behind the door which enables one to set a new combination. Again I managed to get my hands on an unopened safe from trademe. This one is small and light which is a nice for a change. I can just put it on my desk to analyse it. After some internet research I found out that this safe is one of these hotel safes that have a digital combination lock. Next to that is a tubular key lock which is normally covered by a panel which can be removed. This key lock is an overwrite which enables the safe to be opened if the combination was lost or the batteries had died. The person selling had the safe at his rental property and the tenant went overseas leaving no key or combination. I am quite certain that the safe is mostly empty. When shaking it there is only a very small rattling inside (maybe the key?). The keypad shows no signs of life (there are 3 LEDs above the keys which stay dark no matter what I press). 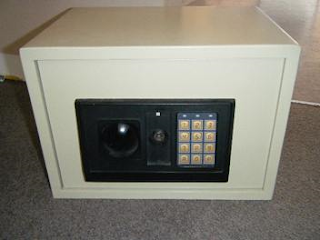 If anybody has any information or manual for these types of safes (like, how to set a combination,) let me know. I think that the key lock is the weak part of this safe. If the batteries are empty it might be the only option anyway. I have been fairly busy lately and did not manage to update this blog as regularly as I would like to. I opened the safe shortly after the last post. It was empty. I tried to manipulate the combination dial for a while. I measure the gate width over a range of combinations but found it to be quite constant in width. The gate is centred around the number 85 and on the side of the safe was a 8 digit number hand written in permanent marker ending in 85. I was therefore quite sure that this number was at least at some stage a valid combination. I therefore tried the combination with different key lock configurations, dialling directions and number of turns in between. And it finally worked and unlocked the safe. It is slightly frustrating to open safe by means of deducting the combination from reading it of markings on the dial or even written on the safe. I still have not managed to open a safe by means of manipulating the lock. I took the back panel of the door and had a look at the mechanics of the locking mechanism. I think it should be possible to deduct the nose depth into the gate by reading the angle of the handle. I haven't tried that yet. I took out the key cylinder and tightened a couple of screws that had come lose, which fixed the problem with the key not coming out. I cleaned it up a bit and the safe is now back in good working condition. This is obviously a fire protection safe, the make is Kingdom Safemakers Limited. Which I think is based in Australia. I would say its a fairly recent model. There are two keys, one of them is in the lock. Both are bent. The key does turn and a click indicates that it disengages some locking mechanism. The key in the lock is stuck and I was unable to remove it so far. The handle next to the key should operate the bolts. It goes down slightly lower when the lock is unlocked (what I assume is unlocked). The combination lock turns nice and freely, one hears distinct clicks with each disk that is being picked up in the lock. According to the clicks there are three of them. No gate can be felt at any location of the dial. However when pushing down the handle the gate is clearly felt around 85. This means that the handle brings down the nose onto the disks. This does not happen so clearly when the key lock is locked. Therefore to measure the depth of the nose in the gate one would have to dial in a combination and then return to 85, pull the handle and measure the width of the gate. I tried this but found that the gate kept a very constant width over all samples I took. Another way would be to measure how low the handle goes, assuming that it directly brings the nose into the gate and therefore indicates the current state of the combination disks. I successfully sold some of the silver from the safe online and reinvested a small amount into buying another unopened safe. I don't think I will find any treasures in this one (I was told by an expert that finding valuables in unopened safes that are sold is a very rare occurrence), but at least will have some fun in opening it. This one has a key and a combination lock. Luckily it comes with a key, which apparently can't be removed. It should arrive in the next few days. The make seems to be Kingdom and a short search online indicates that they are manufactured in Australia. I will post some photos and more information as soon as the safe arrives.